This is why I have dozens of favorite Christmas cookies recipes. Almond and walnut short cookies with colorful frostings, crispy lemon biscuits, cottage cheese rolls, florentines, ahh... Over time they'll get posted here. 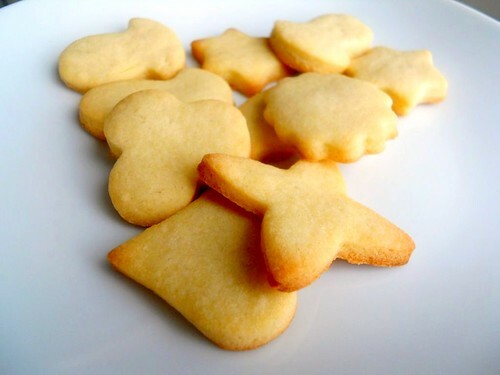 But sometimes I love to bake plain French sablés. Just to have a plate of them on my table when come to the kitchen for a cup of tea. Making Tarte Normande (the recipe follows soon) this week I got some sable pastry left. Thus I got a perfect occasion to get some sables. Cream butter and sugar till light and pale. Add the egg and beat again till it is incorporated. Add vanilla, salt and flour and quickly mix with a spatula. Then scrap the butter out to the table and quickly mix with your hands to get even texture. After you add the flour it is important to get the mixing done quickly, otherwise the cookies may come out too firm. Shape the pastry into a sphere, place in a plastic bag and chill in the fridge for at least 30 minutes. Roll the pastry around 4 mm thick. 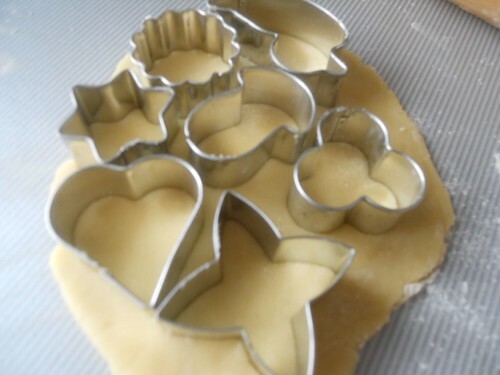 Cut out the shapes you like and place them on a baking sheet covered with baking paper. Gather the leftover pastry and repeat. Bake at 200C for some 8-10 minutes. The cookies should just start getting golden on the sides. Take out and chill on a wire rack. But make sure to snack at least one while it's still warm.